Looking for hiking tours in Europe? Snowy peaks, sparkling lakes and quaint villages are just some of the delights that hiking in Swiss Alps (Grindewald) has to offer. Breathe in the fresh mountain air in Valais and embark on a trail through alpine pastures and glacial valleys with a guided group or independent tour. "Awesome tour! With amazing sights. Would even do it again. 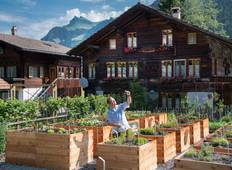 Had a day in Murren to..."
"The food in las heurdes hotel was terrible"
Zermatt: Spend the day soaking up the crisp mountain air. Grindelwald: This is one of the most picturesque towns in Switzerland. Lauterbrunnen: Home to 72 cascading waterfalls and beautiful alpine meadows. 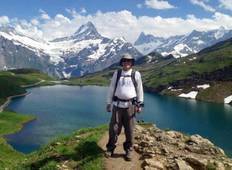 Mürren: Stay at the foot of the Schilthorn peak. Engadin: A long high Alpine valley region in the eastern Swiss Alps. Interlaken: Relax & enjoy the beautiful Swiss scenery. Wengen: Travel to the top of Mt Jungfrau aboard the Jungfrau Railway. Gimmelwald: Discover this small village in the Bernese Oberland. "Great experience with breathtaking views unlike anything else. Fun trip getting to..."